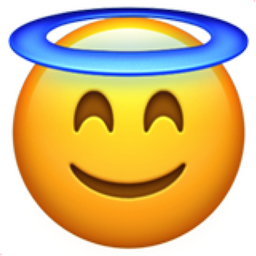 A smiling face with halo, curved eyes and closed mouth. The curved nature of the eyes make the eyes appear as if they are smiling. The halo by itself portrays an angelic nature, but when combined with the smiling eyes exudes more goody two-shoes.